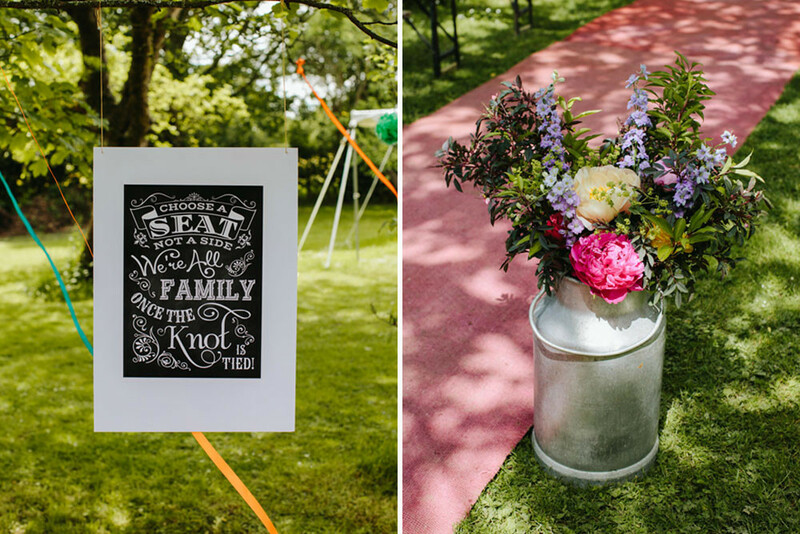 Vibrant Outdoor Blessing | Marquee Reception | Colourful Streamer Decor | Intimate Town Hall City Ceremony & Pub Lunch | Two Wedding Dresses | Mint Green Jimmy Choos | Images by Craig Williams. Suzannah & James had not one but two beautiful weddings, both with completely different vibes and both totally gorgeous & unique. They did the legal bit in Islington’s Town Hall, followed by an intimate pub lunch and wearing the most beautiful vintage attire. Suzannah’s Mum’s 1970s bridal gown to be exact, which was absolutely stunning and must have been incredibly sentimental for Suzannah to re-wear on her wedding day. Then came the weekend of fun at Ridge Farm, or should I say a vibrant festival fiesta which was a complete riot of colour. 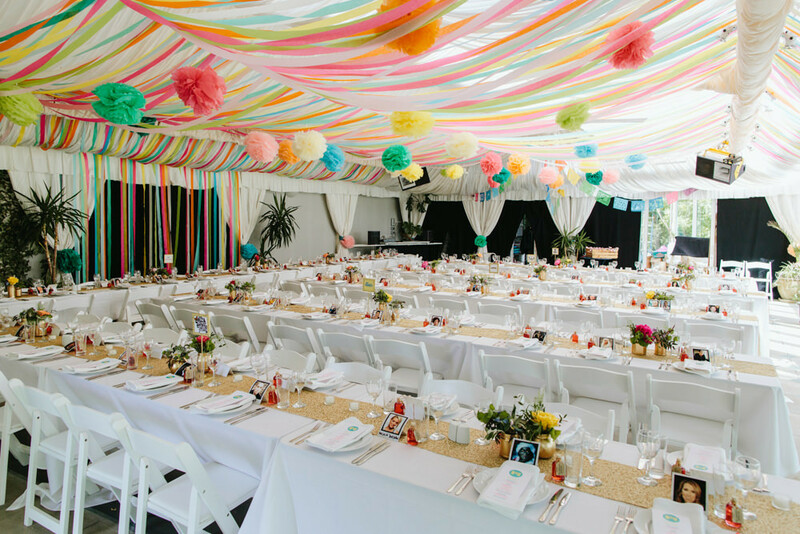 The marquee reception was adorned with colourful streamers, gold table runners and looks utterly spectacular. As does the outdoor blessing ceremony under a tree which very nearly had to be rethought due to torrential downpours! With so many intuitive ideas, DIY decor and dreamy portraits to pour over you’ll be completely spoilt for inspiration this afternoon. Enjoy. 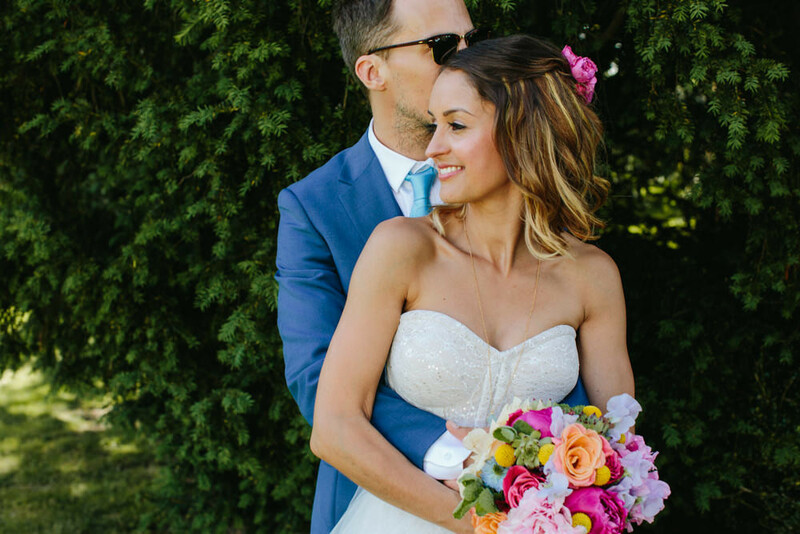 When James and I saw Ridge Farm and heard how they did weddings we fell in love with the fun. 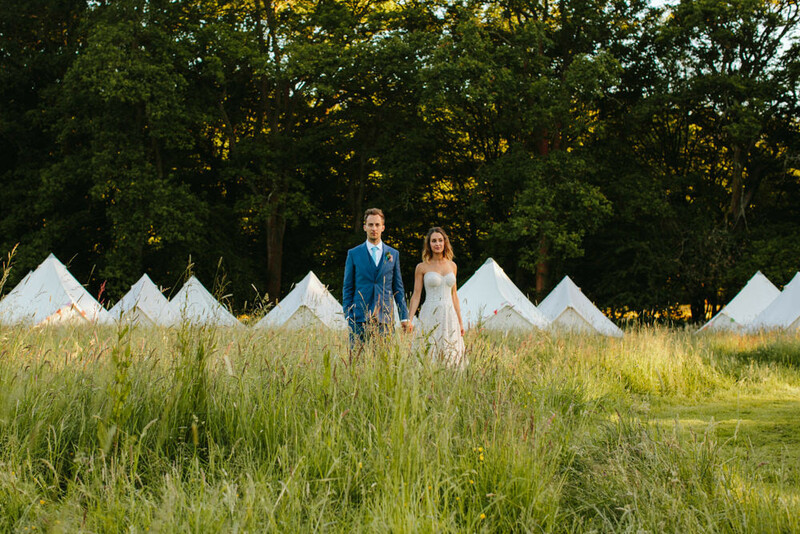 A laid back 3 day wedding bash with room for 26 to stay in the 16th Century farm house, plus space for glampers too, was absolutely our idea of the perfect wedding weekend. The cool music credentials of Ridge Farm’s famous recording history (gold vinyls by Oasis, Pearl Jam and Queen line their hall of fame) helped set the pitch for our festival-feel weekender. The fact Ridge Farm doesn’t have a civil ceremony licence turned out to be a bonus too. Neither of us was desperate to have a service at the nearby church and we preferred the idea of everyone being in one place all day (or weekend!) so it meant, to make it legal, we’d have to have two weddings – a blessing at Ridge Farm on the big day and a legal ceremony somewhere else…poor us! My hugely talented friend Elsie is a graphic designer so there was no one else I was going to ask to get designing the stationery. She immediately scribbled up an S&J logo in gold against turquoise that we used across our website, order of service, menu and table plan. She also honed the bright colours and mixed fonts for the funnest invite I would ever like to receive (if I don’t mind saying so myself). She sourced the gold glitter lined envelopes sealed with gold glitter hearts to add a little extra razzmatazz. James works behind the camera in TV so the photos of our day were super important to him. He went off on a research project and came back with his top 3 wedding photographers. He was less enthused when he realized we had to have skype chats with them all. 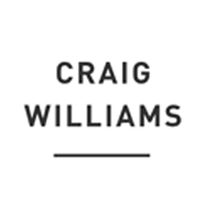 There were a few awkward moments (him sat out of the camera frame grunting – me overcompensating with my face right up against the screen) but we’re so glad we went through the skype cringe as we met Craig & Kate. It was like they were old friends and we knew immediately that they would be the perfect couple to capture and be there for all the special moments of our day. We live in Crouch End so we decided to have a little London do at Islington Town Hall on the Thursday, to tick the legal box. It was just close family & friends, followed by lunch at The Albion. I treated myself to some mint green Choos and wore my Mum’s 70’s wedding dress…floaty, embellished and fabulous. She was in her element telling everyone ‘that’s what I looked like on my wedding day’. 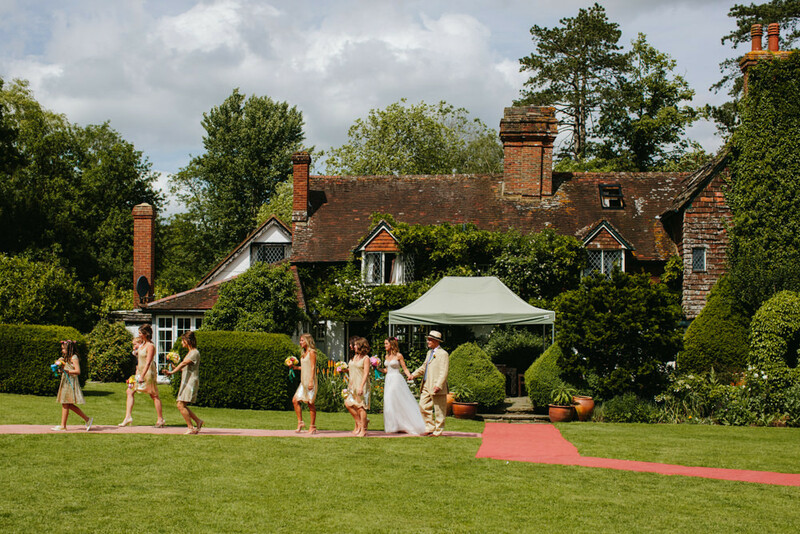 We really weren’t expecting the legal bit to be a big deal, picking the simplest vows and room to say them in and didn’t want it to take away from what we saw as our wedding day with all our friends and family at Ridge Farm. As it turned out, Thursday’s town hall ceremony followed by a magically sunny pub lunch was so special that we’d have been more than happy if it had ended there. It didn’t however as we had the whole weekend at Ridge Farm to look forward to! We got the keys to Ridge Farm on the Friday so we spent a scorcher of a day decorating with all our awesome Bridesmaids, Ushers and fantastic family. We wanted our festival fiesta to be a riot of colour with touches of gold to tie in with all the fun sparkling memories we’ve had with our friends at festivals over the years. 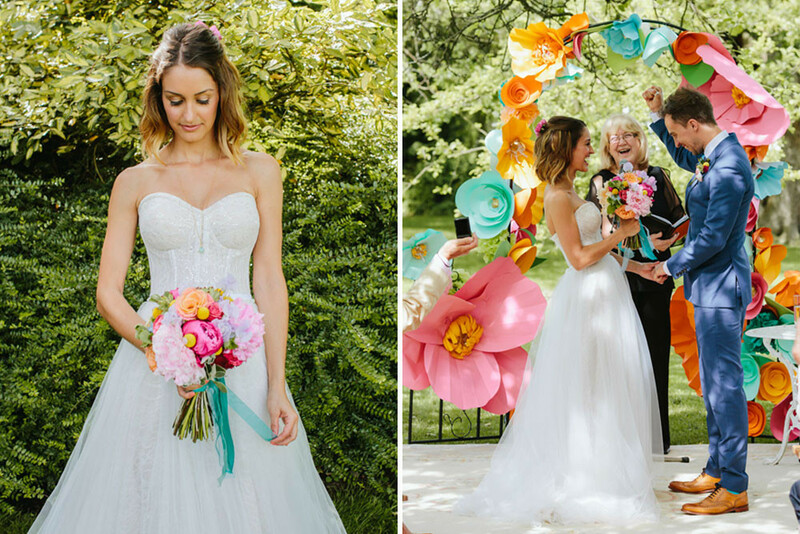 A ‘Day of the Dead’ shoot sparked my inspiration for the bold, bright streamers, papel picado and pom-poms strewn in the ceiling of the reception room-come pool house, as well as the ribbons rippling from the trees in the orchard. A lot of sweat went into the decorating but we wouldn’t have managed it all without the help of my amazing co-ordinator Sama who kept everyone on track…even when pompom fluffing morale was at a low! I’d only got in touch with Sama about 2 months before the big day and once she was booked I had the best night’s sleep since getting engaged! 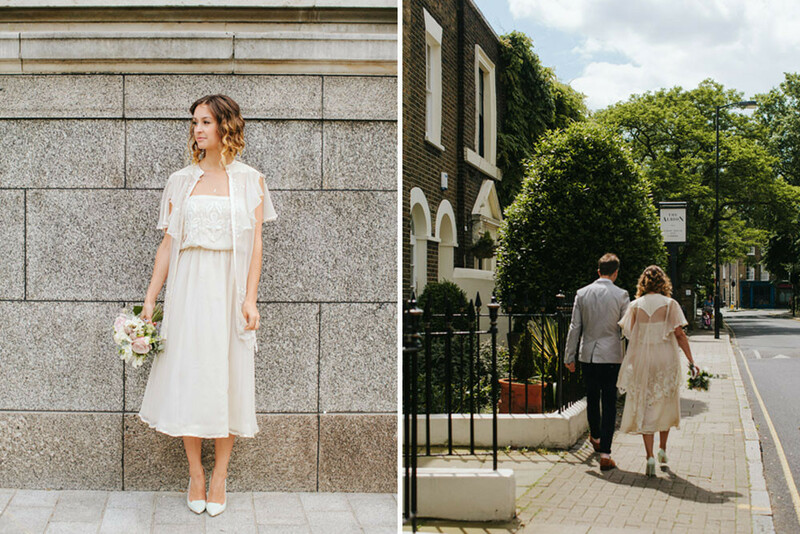 With our DIY do and so many little projects to tie together, her on-the-day co-ordination was just the ticket. Knowing that the raspberry gin I’d spent 2 months infusing for favours wouldn’t get left in a crate or that our ‘Pick A Seat Not A Side’ sign wouldn’t forget to be hung in the orchard turned me into chill pill bride. Since the little London ceremony I’d been bouncing around in a bubble of bliss so I couldn’t give a damn about ‘plan b’ and the chubby rain on Saturday morning. Frank, the lovely owner of Ridge Farm for 30+ years, had assured me it was going to brighten up. He could tell by the cows in the fields. So as far as I was concerned we’d be in the orchard as planned. The trees in Ridge Farm’s orchard make a natural aisle under a beautiful bower canopy which I’d imagined walking down and getting married under since our first visit. I’d seen a gorgeous arch made of huge paper flowers on Pinterest, so I spent many a crafternoon cutting, gluing and curling a rainbow of huge petals for our flower arch focal point. It was risky but Frank had said it’d be sunny so as the last few raindrops dripped, Sama set up the orchard an hour before the first guests arrived. My Bridesmaids had been down to see it and came back squealing at how gorgeous it looked. They were adamant that I shouldn’t see it until I walked down the aisle but I knew that when I was walking towards James I wouldn’t be taking everything else in. Creeping down with my Sister in those moments before it all kicked off was one of my favourite memories. There was that dewiness in the air and fresh smell of wet grass and everything just felt so buzzy and alive. The orchard looked magical. In the tiny time after the rain Sama had strewn the branches arcing over our aisle with streamers and pom poms and at the end of the aisle the bright arch of paper flowers was just as I’d imagined. After I’d asked James to find someone to marry us at Ridge Farm, he said he had humanists coming out of his ears. After my Godson’s Christening…in Bristol…he went right up to the lovely registrar and asked her on a whim if she’d drive all the way to Ridge Farm, West Sussex to marry us in June. No chance, I thought. James’s direct approach paid off though and Rosemary agreed to drive across the country for the blessing. We didn’t know her well but she brought a sense of calm and having her conduct the ceremony made our blessing feel official. She even brought commemorative certificates for us to ‘sign’. I walked down the aisle to Elbow, One Day Like This, one of our fave songs which we hoped set the tone for the fun to follow. James is a West Ham fan and as we wanted to get bubbles into the day (in honour of WHU’s anthem) my flower girl walked down the aisle blowing a bubble gun (which didn’t actually work). We asked my oldest school friend, Ellie, to read from The Little Prince – a book that James gave me the week we got together. His school friend Ty read the end passage from Any Human Heart about enjoying life to it’s limit and living for the moment. When James found that passage at home, he started choking up and couldn’t read it to me so we knew it had to be included. To lighten the tone our friends performed ‘I wanna grow old with you’ from The Wedding Singer. We wanted to walk back down the aisle to something dancy to get the party started so picked ‘You Got The Love’ – Candi Staton’s version obvs – and, though James didn’t probably realise, it was my little nod to SATC. From the outset I knew I wanted my girls to look hot. As ever with Bridesmaids their different heights and sizes left us stumped. I thought about a mismatch line up of dresses but with so much going on elsewhere I plumped for just a jot of co-ordination with my friends all in a gold sequin Etsy number by Dahl NYC and my Sis in an embellished gold All Saints dress. My flower girl’s dress was actually the first thing I bought for the wedding, a fully gold sequinned party dress from I Love Gorgeous. If only they made them in adult sizes! Teamed with her gold Converse and flower crown she looked so damn cool. 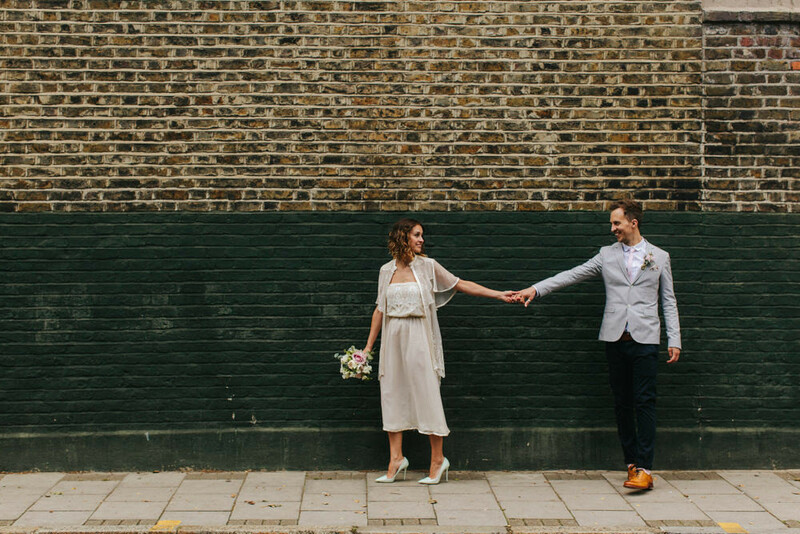 My dress was a bit of a disaster…I still didn’t have the one I’d ordered until the day before the London wedding but the bridal shop where I’d ordered it were more than apologetic, gave me a refund and a version of my dress. Needless to say I don’t look at the dress thinking it was the one but it didn’t really matter in the end. The boys had to do a lot of running around to get enough benchs and chairs for the blessing so by the time it came to pictures they made for quite a disheveled line up, bless them. James found his sharp suit in Reiss where we were so impressed with the in house tailor. Find her in Covent Garden! From our kaleidoscope of colours, he picked turquoise for his boys to tie in with their ties, socks and for my Godson’s dinky braces and bow tie. To tie in with our colour popping palette my talented friend and florist, Sarah of Poppies&Peonies created textured bunches and buttonholes made of succulents, coral charm and peonies and wound turquoise ribbon around everything to tie it all together. 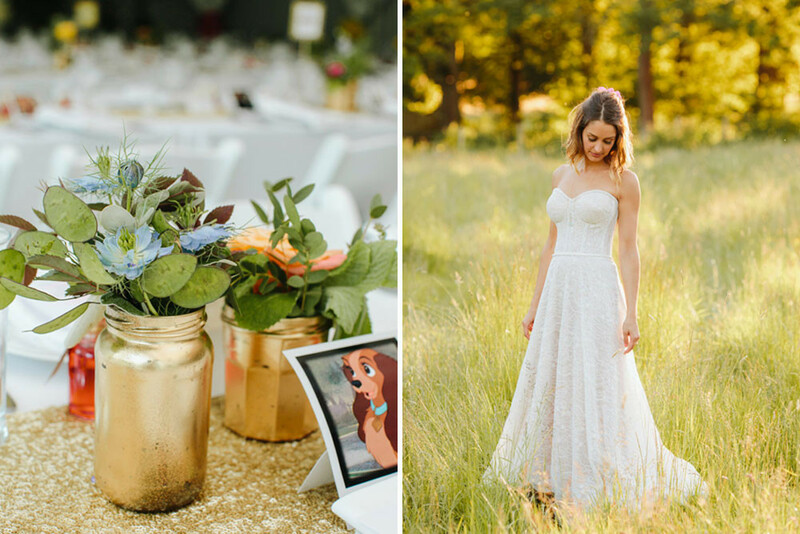 I spray painted 100 different sizes jam jars gold for the tables which Sarah filled with a rainbow of bright posies. These were sat on gold sequin table runners made by my Mum. I love the light on early summer evenings. It reminds me of honey. Maybe I was on cloud nine and a few glasses of Champagne down, but as the sun set and the honied light lit up the room, every touch of gold on the tables glimmered and gleamed. One of James’s friends looks like Ed Milliband. Discussing this on a long car journey 6 months before the wedding, James had an Eureka moment and suggested we did doppelgangers as the name places for every one of our guests. Thinking of a look-a-like for all of them was a massive job but it was one of my fave touches of the day and as our friends have all got a pretty good sense of humour, everyone loved arriving at their seat to see a Polaroid of Kirsty Alsopp, A Hobbit or Penfold from Mighty Mouse looking back at them. I’ve been to a few weddings where the couple are funny about any pics going on social media. Apart from this seeming a tad precious to us, we greedily wanted to grab all our friends photos. In place of old fashioned disposable cameras on the tables, we asked everyone to ‘send us a selfie’ and use a hashtag so we could find all their pics on Instagram. After the wedding we used all their selfies (most holding up their lookalike place name) to make a thank you card collage. James also took a wedding selfie before we walked back down the aisle and asked everyone to bundle in behind on their benches. It’s a great pic with everyone peering in to be seen and waving manically in the back rows. Do it! I’m the Cookery Editor at Good Housekeeping magazine so the wedding food was probably the thing that stressed me out the most. Every time some said, ‘oh the food at your wedding’ll need to be amazing’ I wanted to slap them in the face with a chicken supreme. When catering quotes started coming in I considered doing it all myself. In the end we found a local caterer, Bricks, who were so accommodating, even after I sent pictures from our test kitchen at work of just how I wanted the food to be styled and to prove that pasturised egg white for our pregnant friends would whip up just as glossily as unpasturised (cringe!) For us it had to be sharing food passed down our long family style tables on big groaning platters. To start with our friends Ben & Jo, who own a gourmet food company, created amazing antipasti boards. For the main and pudding I picked recipes from my fave food writers; Sophie Grigson’s BBQ-ed Butterflied Leg of Lamb for the meat-eaters, Ottolenghi’s Roast Veg Tart for the veggies with Jamie O’s Mothership Tomato Salad and Delia’s Potato Salad and The Meringue Girls Gooseberry and Strawberry Meringue Jars. It was a menu that was laid back but most importantly to me looked colourful and Bricks recreated each dish perfectly. We unintentionally ended up with a wedding soundtrack of amazing songs that had peppered the day at specific points and have made our memories that bit stronger. We asked the string quartet from Hoi Polloi restaurant to play in the garden before and after the ceremony as we knew they’d get it pitch perfect with beautiful string arrangements of fun songs that everyone knew. They had already played us down the aisle to Elbow, One Day Like This and but we were so busy at the reception so hadn’t had a chance to listen to all their other covers. When our amazing photographers, Craig and Kate quickly grabbed us for some pics, and the quartet belted out the opening strings to Clean Bandit, Rather Be, I knew it was money well spent. Hearing that song was one of my clearest moments of the whole day. Before the speeches we nipped out for some more pics but because we’d kept everyone waiting, James’s Best Man got the whole room chanting Blur’s Tender…the ‘come on, come on, come on’, bit was pretty apt! I organized a secret sing-a-long to surprise James. He’s known for DJ-ing (pretty poorly) at parties and ending the night with We Could Have Been Anything That We Wanted To Be from Bugsy. I asked my Hens and James’s Stags to get to know the song so it wouldn’t fall flat on it’s face, then hid song sheets under the table runners. When we all stood up and that plinky piano at the start began to play, James was elated. It wasn’t long before he led us all to stand on our chairs and give it some welly. We’ve spent many a festival dancing round The Disco Shed in a field so it seemed obvious to book one of their brilliant DJ’s, complete with little shed, hanging baskets and gnomes to bring the party vibes in the evening. I soon decided to get on the mic and prove to the assembly that I knew the whole rap to Jurassic 5’s ‘Concrete Schoolyard’. Lucky crowd! Thankfully our friend Max Sedgley also DJ-ed. When he played his song ‘Happy’ the dancefloor just went off the hook. To keep with the happy theme, James’s Ushers filmed everyone singing and dancing to different lines from Pharel’s ‘Happy’ in a boogy booth in the woods. Edited together it’s ridiculously brilliant music video. The only way to party until dawn but also respect the 2am curfew was to have a silent disco of course! Complete with head sets, glow sticks and UV face paint we raved till the early hours. Having all those musical memories makes the day easy to relive. This is the most beautiful thing I’ve ever seen!!! Seriously rethinking my colour palette right now…! Absolutely LOVE the colours in this wedding!! I’m a wedding photographer and VERY jealous of Craig and Kate for getting to shoot this! !